NEW MEMBER CONTEST - 1st Beacon Valley Grange No. 103; 2nd Ekonk Community Grange No. 89. YOUTH MEMBERSHIP AWARD 1st Ekonk Community Grange No. 89. JUNIOR GRANGE NEW MEMBERS – Ekonk Junior Grange No. 101. POSTER CONTEST - 1st. Lois Evankow – Lyme Grange No. 147, 2nd Irene Percoski - Enfield Grange No. 151 and 3rd – Kay Ruff – Glastonbury Grange No. 26. Figures received by our State Master from the National Grange reports that the following Granges had a net gain: Beacon No. 118 (3), Cannon No. 152 (3), Granby No. 5 (4), Hillstown No. 87 (8), Eureka No. 62 (10), Winchester No. 74, (10), Higganum No. 124 (14), Enfield No. 151 (20) and Bridgewater No. 153 (21). The number of entries received in all of our contests was very discouraging. Our committee will advertise, push and do whatever we can to encourage more Granges/ Grangers to enter. Remember - there is no set policy to getting new members, no crystal ball to tell you what to do. It’s whatever works for each individual Grange. One thing we do know. If you don’t ask your neighbors, family and friends to join they are not going to ask you. So start asking. 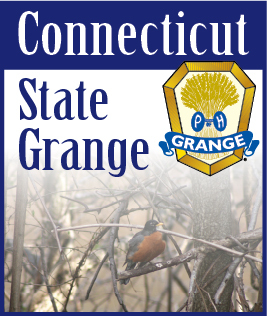 Give your Grange a Christmas present and get a new member.